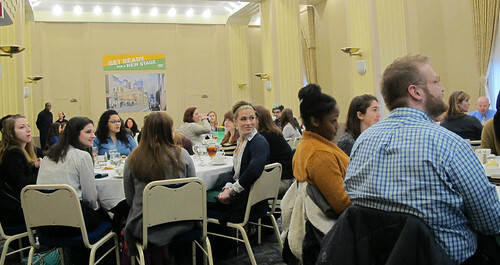 At the University's annual Martin Luther King Jr. Day Leadership Luncheon Jan. 18., Point Park Trustee Rep. Jake Wheatley Jr., D-Allegheny, encouraged students to have the courage to lead change in their communities and strive for social justice. "All of you are leaders in some capacity. You were leaders before you came here today. The question is, what will you do with your leadership position?" asked Wheatley. "Whatever the issue is, there is an issue out there for you and your talents." Wheatley's message left a strong impact on the students. "One of the parts of Rep. Wheatley's speech that stayed with me is when he told the story about how he stood up in the middle of his college convocation to fight for better representation for his major," said Vania Arthur, a sophomore photojournalism major, member of the Black Student Union, and photographer and video assistant for the Honors Program. Arthur added: "When he said, 'Sometimes you may be the only one to stand up and pave the way so others can have a better life,' it really made me think more closely about my words and actions." "Rep. Wheatley's speech stuck with me because he talked about putting aside your fear and doing what is necessary for the greater good," said Kim Prelosky, a senior sports, arts and entertainment management major and executive director of the Campus Activities Board. A decorated United States Marine combat veteran, Wheatley advised students to develop both their career ladder and leadership ladder while in college - and to use Point Park University as their training ground. "I appreciated Rep. Wheatley's encouraging words that we should involve ourselves in social justice efforts while in college. A group of college students really can evoke change, which schools like University of Missouri have proven," remarked Amber Flevaris, a junior SAEM major. "His message that no issue is too large to tackle really resonated with me," added Flevaris, who is president of the SAEM Club and a member of The Body Christian Fellowship and the Honors Student Organization. Following Wheatley's speech, the Office of Student Affairs led roundtable discussions at the luncheon on the topic, "What can social justice look like on college campuses?" "Social justice takes on many forms. There is a social justice topic for every leader within his or her community to address," said M.B.A. student Diane Weston. On the evening of Martin Luther King Jr. Day, the Honors Student Organization created a "We Dream" handprint mural and collage. "We had students create this lovely mural with their hand prints and then write down dreams they have for themselves, their friends, their family, the world and the future," explained Victoria Ventura, M.A. in leadership student and graduate assistant for the Honors Program. "We were amazed by their selfless answers." What does MLK Day mean to you?